For a long time, Wombat was my preferred Vim color scheme, but about a year and a half ago, I had become bored with it. I wandered in the desert, looking for new color schemes. I turned to Obsidian, Jellybean, Twilight, Tomorrow and its variants, Solarized and its variants, and even Monokai—and they’re all good, except perhaps for Monokai—but at last, I’ve returned to Wombat. The constituent colors work well together (basically variants of RGB, plus white and shades of gray), and it’s dark, so it’s easy on the eyes. Maybe I’ll leave Wombat for good one day, but it’s just such a good color scheme. It also exists for other editors, although the color assignments are not exactly the same as with Vim. With a new child and new house, I’ve been quite busy these days. In the spare moments I have I’ve been learning Haskell for fun and profit. A few days ago I started toying with using Haskell to do Kleene logic. My inner math geek has been yearning to get out, and I’ll see where it takes me. Also, as a typography geek, I’ve been fiddling around with TeX and friends. I’m amazed by the beautiful output that can be achieved by these technologies. I’m also considering trying my hand at creating an open-source font. Yesterday at work I needed to figure out how to map an ASP.NET MVC route to a directory of static XML files. I came across this blog post about how to do it. As I implemented it, I realized that their example is wrong. In their example, the work of writing to the ResponseStream is done in the GetHttpHandler method of their implementation of IRouteHandler. But notice what GetHttpHandler returns: an IHttpHandler. In their example, they do the writing to the stream, and then return null. I’m working on a project at Ancestry.com which involves URLs with fairly long integers—that is, integers up to eight digits or more in length. To shorten these IDs, we’ve decided to base-36-encode them. So, for example, 17,012,00010 = A4MJK36. Now, the number of IDs that will be encoded is on the order of 108. What is the likelihood that at least one of those IDs encodes to something vulgar in English? See, for example, what 1,329,077 encodes to. I cannot take the risk that this may happen. What, then, is to be done? Note that the digits in “normal” base-36 encoding are 0, 1, 2, …, 9, a, b, c, …, z. But suppose we used a different alphabet? What if we just removed the vowels, say? That would leave us with an alphabet of 31, not 36 characters, so we would then be base-31-encoding the integers instead of base-36-encoding them. Is that OK? Well, for my purposes, it is. Note that any base-31 representation is a valid base-36 one, too (for a different number), just as 10 is both a valid base-2 and base-10 representation—meaning 2 in base-2, and 10 in base-10. # We're only dealing with nonnegative integers. raise Exception() # Raise a better exception than this in real life. This can never give vulgar English words, since all English words have vowels in them. At least, it’s good enough; I suppose dirty acronyms could still be made, but that’s obscure enough for me. Note that the code above will encode with any alphabet of two or more symbols, as long as the symbols are distinct. So, an alphabet of "01" will give you the binary encoding, "012" the ternary, "0123456789abcdef" the hexadecimal, and so on. Of course, "-+" gives a binary encoding, just with different symbols than those normally used. Since capital letters are distinct from lower-case letters in ASCII, you can base-62-encode a number with "0123456789abcdefghijklmnopqrstuvwxyzABCDEFGHIJKLMNOPQRSTUVWXYZ" if you wanted to. source = "<pre class=\"prettyprint highlight\"><code>"
This is my first stab at a Liquid tag. I want to add the ability to pass certain parameters to the tag, mostly to support the parameters that Google Code Prettify blocks can support. Sometimes I find myself reusing certain paradigms in code in different projects. Many of these paradigms are the standard design patterns. There is one paradigm I’m using in a project right now that I’ve noticed I’ve used in other projects before. I call this pattern the Iterable Stream. Say you have a data file or even just a stream that contains multiple records. A common example of this would be a character-delimited file which has records separated by newlines. # Do something interesting with each record here. // Do something interesting with the record here. Though not as fancy as Python, using C#’s yield return syntax lets you easily make a stream iterable. We’ve been using file streams here, but it should be clear that this pattern could be used for most any stream. Making use of C#’s yield return syntax or implementing the IEnumerable<T> interface can make a data stream iterable and hide the ugly details of doing so. I use FeedBurner for this site’s feed. I like what it tries to do, though I am a little concerned about possible neglect on Google’s part. Normally, FeedBurner checks each feed every thirty minutes to see whether there is new content. This is, of course, much too slow for those of us who want real-time publishing of items to Twitter or Facebook or some other social network. There is a form at the FeedBurner site that you can use to ping FeedBurner manually. Incidentally, that page refers to the “Ping and Extended Ping XML-RPC API” which is apparently defunct. Using the form makes a GET request to /fb/a/pingSubmit, whereupon the result of the request is displayed—that is, whether it succeeded or was throttled or failed. To publish this site, I have a Rake task that uses this API to ping FeedBurner. More details of the API are at the service endpoint. I’ve recently been doing some JSONP-related stuff with ASP.NET MVC 3, and I decided to make it into an open-source library. It provides a JsonpResult which is a subclass of MVC’s JsonResult, as well as an abstract JsonpControllerBase, from which you can subclass your controllers, which provides a Jsonp method (and various overloads) which return a JsonpResult. "Enterprise", "Excalibur", "Yorktown", "Oberth", "Hood", "Reliant"
You can grab it at GitHub or get NuGet binaries. I have always been fascinated by the idea of simulating social phenomena. In my youth I would spend hours playing President Elect, Balance of Power, SuperPower, and other games that purported to simulate political and economic phenomena. I have recently come across a mathematical model of voting, called the spatial theory of voting, which I shall discuss here. We often speak in terms of the political spectrum, which we think of as a continuum along which we may identify a person’s ideology. On the right, we have right-wing ideology, and on the left we have left-wing ideology, and in the middle, we have centrist ideology. This continuum has certain properties. For example, we hear things like, “he’s to the left of Ted Kennedy,” or, “she’s more conservative than Ronald Reagan.” This implies that on this continuum we may rank ideologies as being “greater” or “lesser” than others, or more “rightward” or “leftward” than others—that is, given two ideologies and , , we can say that or —without making any normative judgment, though people often use such rankings to make normative judgments. Careful thought, however, reveals that the arrangement of ideologies might be more complicated than placement on a one-dimensional continuum. This is the motivation of the Nolan chart, which places ideological positions in a two-dimensional space which I call Nolan space. One axis represents a person’s economic freedom “score,” while the other represents the person’s personal freedom “score.” Regions of the Nolan space correspond to general ideologies. There is no reason we cannot measure a person’s ideology with respect to more than two measures. We can therefore work with higher-dimensional spaces, though visualization may be more difficult for four or more dimensions. which allows us to specify the importance to which an elector gives each element of the elector’s ideological preference. 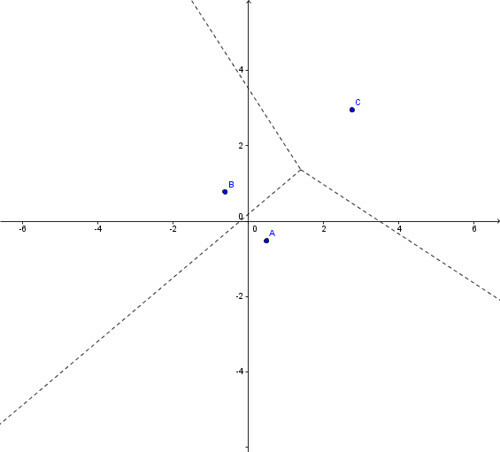 When , then the distance reduces to the un-weighted Euclidean distance. For the purposes of this discussion, we will restrict ourselves without loss of generality to Nolan space. Note that if , then , and is at a maximum. Thus there would be no other candidate than that represented by that gives the elector more utility. This implies that, in elections in which candidates are also electors, rational candidates should always vote for themselves. With the foregoing utility function, we see that each candidate will command an electoral zone in which each elector whose ideological preference is in the zone will have maximum utility of voting for that candidate. These zones are, in fact, Voronoi tessellations of the ideological space. For first-past-the-post elections, that candidate whose electoral zone encompasses the most ideological positions of the electors is the winner of the election. Figure 1. A three-candidate election in Nolan space and each candidate's electoral zone. In this election, candidate A might be a center-right candidate, candidate B a center-left candidate, and candidate C a classical liberal candidate. The distribution of electors in the ideological space is probably not uniform, especially when the number of electors is large. In American political parlance, there are some “red states” and some “blue states,” and within states, there are “red” and “blue” counties and townships. This implies that we could treat the distribution of electors as a probability distribution. In a particular election, the electorate could be distributed multivariate-normally or some other way. Economists Antonio Merlo and Aureo de Paula at the University of Pennsylvania, in their paper “Identification and Estimation of Preference Distributions When Voters are Ideological,” assert that by studying election results, one can estimate the ideological distribution of voters in an election. But suppose one already knows (or suspects) the distribution of the electorate. This spatial model would make it possible to predict—or at least simulate—electoral outcomes. This would be a matter of creating a Voronoi tessellation of the ideological space and “counting” the number of electors in each electoral zone, according to the distribution of electors. Viewed in the light of the spatial model, campaigning and electioneering can be seen as the efforts of candidates to maximize the number of voters in their electoral zones. This can be achieved either through convincing the electorate to move their ideological bliss points into the candidate’s electoral zone, or by moving the candidate’s ideological position so as to acquire a greater number of electors, which has echoes of the median voter theorem. This model of voting is all nice and neat, but is it actually useful in describing reality? Let’s revisit some of its assumptions. Electors are ideological. Do electors always vote ideologically? Might they not vote for other reasons? Is it realistic to have a utility function that numerically describes an elector’s utility of choosing a particular candidate? Are electors’ utilities really cardinal and not just ordinal? Isn’t value subjective? Is it valid to compare two electors’ subjective utilities? Is it realistic to assign numerical values to ideologies and place them in a metric space? Electors have good information about their own ideological preferences and those of the candidates. Can each elector accurately “calculate” the elector’s distance in the ideological space to each candidate, or at least to the nearest candidates? All electors vote. This is clearly false in the real world. Could we modify this model to capture the fact that many electors do not vote? Would it matter if we could? This model may be predictively good in certain electoral situations, and it may be helpful in determining voter distributions, so long as the assumptions hold. But voting is primarily a matter of human action, which is notoriously difficult to predict accurately. But for less-serious, simulative purposes, this model might be useful for quasi-realistic prediction and simulation, such as for political simulation games. I have for some time wanted to have my own web presence—a place on the Internet which could serve as the center of my “geek life,” or even the center of my larger life. I have had a blog for some years now, and I have moved between WordPress and Blogger during that time, in addition to flirting with Posterous and Tumblr. None of those services gave me the total control I wanted, and besides, a blog is only a part of one’s web presence anyway. I have experimented with GitHub Pages and Jekyll (and Markdown) and found those technologies to be better suited to what I want to accomplish. I won’t bother migrating my previous blog content to this site; I intend for these notes to be, on the whole, larger and more substantive than my previous blog content. In fact, the reader will notice that these notes are, for one thing, called “notes,” not “blog posts,” and for another, there is no place to comment on these notes. This is entirely by design, since what I intend for these notes is not entirely to serve the purpose of blogging, but rather as a place for essays. For shorter, more immediate posting, there are Twitter (which is, after all, a microblogging service) and Google+. The last post on my previous blog contains a brief message and a link to this new site. Because I intend for the notes on this site to be generally larger and more substantive than my previous blog content, they will likely be a bit more infrequent.